5. To Stay Or To Go? 8. Ragweed Was Not the Culprit! The changes to Bethlehem’s tourism economy from the 1930s were compounded by the developments of the 1940s. The introduction of air conditioning in the 1930s and antihistamines in the late-1940s provided easy, cost-effective relief to hay fever sufferers. This was an attempt by cities to create cleaner indoor environments to keep people in the cities during the summers . Beginning in the 1920s and intensifying from the 1930s to the 1950s, the American people began to transition from travelling by train to travelling by car. In addition, the paving of roads created a market for roadside hotels called motels . These roads sprouted ragweed along their edges and, as a result, created issues for hay fever sufferers. The discovery of 2,4-dichlorophenoxyacetic acid’s effectiveness as an herbicide in 1946 made ragweed control possible. Though there is debate as to the actual effectiveness of the herbicide, it was widely used by the 1950s . Bethlehem was aware of the ragweed problem that roads created and began a town-sponsored ragweed control program in 1949 . There is no concrete evidence that they used an herbicide like 2,4-dichlorophenoxyacetic acid, but, during the same time period, other towns in New Hampshire were spraying ragweed with an herbicide . The baby boom expanded the existing road infrastructure and highlighted the changing nature of work in America. The middle-class, which grew during the 1950s, seemed to be the perfect group to help rejuvenate the tourism economy in Bethlehem. There were, however, two problems with these middle-class Americans. The first was their preference for cars and motels and the second was the middle-class work schedule. Middle-class Americans wanted the freedom to take their car anywhere and stay for whatever length of time suited them. Because of the strict middle-class, 9-5 schedule, most of them could not afford to stay in a grand hotel for more than a week . This, not surprisingly, led to a decline in tourism. Like the decline in tourists, throughout the 1950s ragweed control funding fell steadily after its initial boost. The reasons for this are unclear, but the ten-fold increase in funding in 1959 has a visible cause . 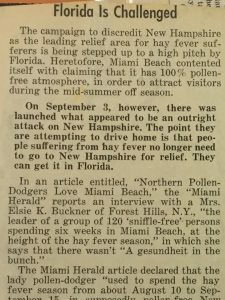 Dr. Herman Blum published an article in the Littleton Courier on August 27, 1959, pushing for more support of the National Hay Fever Relief Association (NHFRA). 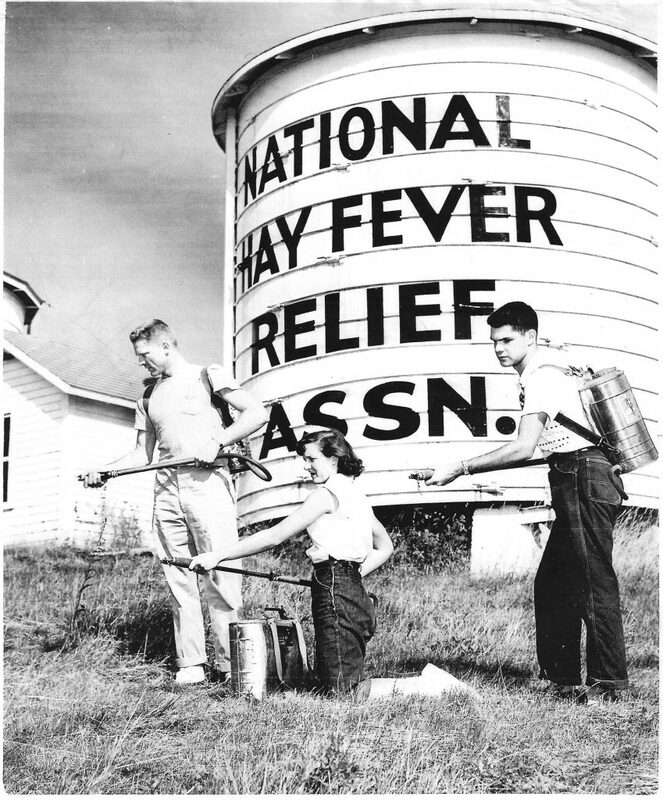 The NHFRA had been losing money and, with more financial support, Dr. Blum believed the NHFRA could bring more tourists to the town even in non-hay fever months . This article brought optimism and a sense of bringing back the past that continued into the 1960s. The reinvigoration got off to a quick start. Throughout the 1960s, ragweed control was given a sizable budget . 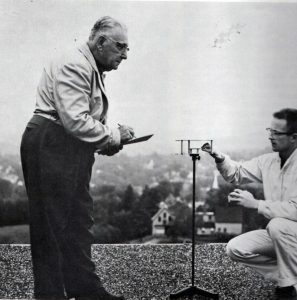 In 1961, Dr. Blum established a pollen-counting system with funding from the NHFRA. This pollen-counting system measured daily pollen-count levels and used that data to determine seasonal trends. By 1964, there were four pollen-counting stations built with financial support from the town in and around Bethlehem . One of the main reasons for the pollen-counting stations comes from an unlikely source. The accusations began in the summer of 1962. The Miami Herald published an article claiming to have interviewed a woman who used to visit Bethlehem. That woman claimed Bethlehem was not pollen-free anymore . The pressure to prove what had been anecdotally true in Bethlehem–that it was pollen-free–fell on Dr. Blum. The accusations continued throughout the 1960s even after Dr. Blum’s pollen-counts were proving that Bethlehem was virtually pollen-free. In 1962, the pollen-count average was near zero; in the 1964 season pollen-counts ranged from 0 to 1.78, the 1965 average was 1.4, and the 1966 average was 0.43 grams of ragweed pollen per square centimeter . To put those numbers in perspective, a 1948 article in the New York Times stated a pollen-count under 5 meant potential relief from hay fever symptoms . With numbers like Bethlehem’s, hay fever relief was almost guaranteed. Despite the concrete, scientific data, the Miami resorts continued to challenge Bethlehem’s hay fever haven status. The battle lasted throughout the 1960s. 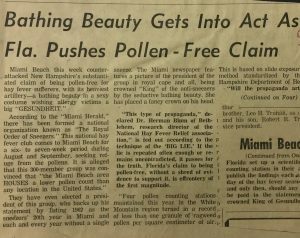 In 1969, in an article in the Littleton Courier, Dr. Blum again attempted to prove Bethlehem’s pollen-free status and asked Miami to substantiate its claim of superiority. In that article he continued to argue, with pollen-count data to back him up, that Bethlehem was the ideal hay fever resort . Unfortunately, the damage had already been done. By 1973, public opinion and the lasting impacts of motels, cars, and the middle-class work schedule had crippled the old, 1890s-style tourism in Bethlehem. The closing of the Sinclair in 1973 signaled the end of the Hotel Era. One thing remains clear, however: ragweed growth in Bethlehem did not cause the tourism economy to fail. Bethlehem’s tourism economy was the unfortunate victim of modernizing America. Public opinion that falsely claimed Bethlehem was not pollen-free had the power to stop people from going to Bethlehem. The use of false claims and the use of spin are not old tactics; in fact, they’re still used quite effectively today. Antihistamine date: Gregg Mitman, Breathing Space: How Allergies Shape Our Lives and Landscapes (New Haven: Yale University Press, 2007), 88. Air-conditioning date: Ibid., 7. Robert F. Carlson, Charles L. Hamner, and Frederick G. Smith, “Control of Ragweed Pollen Production with 2,4-Dichlorophenoxyacetic Acid,” Science 108, no. 2677 (Apr. 19, 1946): 473. Gregg Mitman, Breathing Space: How Allergies Shape Our Lives and Landscapes (New Haven: Yale University Press, 2007), 85-86. Annual Report: Town of Bethlehem, New Hampshire 1949, (Littleton: Courier Printing Company, 1949), 7. Annual Report of Berlin, New Hampshire 1953, (Berlin: Smith and Town, Printers, 1953), 17. Christopher Johnson, This Grand & Magnificent Place: The Wilderness Heritage of the White Mountains, (Lebanon NH: University Press of New England, 2006), 146. “Haven for Hay-Fever Sufferers at Bethlehem is Regional Asset,” The Courier (Littleton, NH), Aug. 27, 1959. “Dr. Herman Blum,” National Hay Fever Association (1964). “Florida is Challenged,” The Courier (Littleton, NH), 1962. “Region Reports Low Ragweed Pollen Counts in Crucial Week,” The Courier (Littleton, NH), Sep. 20, 1962. “Dr. Herman Blum,” National Hay Fever Association (1964). “Asks Cooperation of Governor in Setting up Pollen Counting Stations,” The Courier (Littleton, NH), Aug. 18, 1966. “Pollen-Count Report,” The Courier (Littleton, NH), Sep. 1966. Joseph Hirsch,“Some Hay-Fever Havens,” New York Times (New York, NY), Aug. 1, 1948. Herman Blum, “White Mts. Has No Peer in Providing Relief from Hay Fever,” The Courier (Littleton, NH), July 17, 1969.